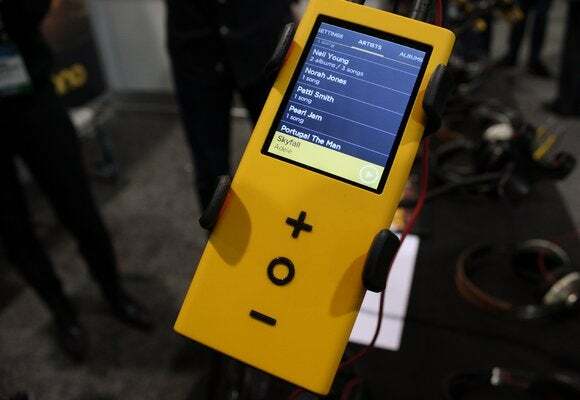 After years of trash talking the state of the MP3, Neil Young's Pono Player is finally here and will hit retail shelves on Monday, January 12 for $400. Young made the announcement during CES 2015. The Pono Music Store—featuring high-resolution audio tracks—also recently went live in anticipation of the Pono Player's release. Specific details about Pono availability have yet to be made public, but the Player will apparently be available at 80 locations nationwide including Fry's stores, according to The Verge's report from CES. Neil Young showing David Letterman the Pono Player in 2012. The Pono Player comes packed with 128GB of onboard storage and has a microSD slot to support another 64GB of removable storage. It also comes with a 2.5-inch color touchscreen for navigation and control. One big selling point of the Pono Player is its high-end digital-to-analog converter (DAC), the ESS ES9018M. The Pono Player, coupled with hi-res audio tracks that have a recording quality up to 192kHz/24-bit, are supposed to make for a far superior listening experience to what you can get on your smartphone or iPod with MP3 and AAC files. Why this matters: High-resolution audio has long been the province of audiophiles willing to shell out big bucks for expensive niche equipment. The Pono Player with Young's backing, however, is the first serious attempt to push hi-res audio into the mainstream. Whether it will succeed to gain a bigger audience for hi-res music seems doubtful. There is serious doubt that hi-res audio equipment and files are worth the higher prices you pay for the experience. Experts argue that you can't hear the difference between a properly encoded MP3 track and a hi-res audio version. 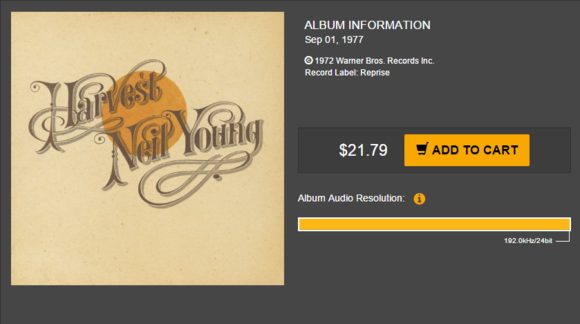 Neil Young's Harvest sells for $21.79 on the Pono music store. To really test the Pono Player's chops you need to purchase music tracks that offer higher sample and bit rates than what you get from an MP3 or even CDs. Those higher rates don't come cheap, however. Looking at Pono's music store you can pick-up Pearl Jam's Ten for $18 for a 44.1kHz/24-bit recording. The same album on Google Play offering MP3 versions is just $7. Bruce Springsteen's Born in the U.S.A. is $18 on Pono for a 96kHz/24-bit recording compared to $7 on Google Play for MP3s. Neil Young's Harvest with 192kHz/24-bit tracks is a whopping $21.79 compared $9.50 on Google Play. The ability to buy tracks on Pono varies. Springsteen and Pearl Jam offered single tracks for $1.99 a pop, while Neil Young's album was all or nothing. If you can't get the Pono at a retail store near you, the device is also available for purchase online. At this writing, the company was accepting pre-orders for devices shipping in February.